AdjustedCostBase.ca provides a feature to premium subscribers allowing transactions to be uploaded in bulk from a spreadsheet into the ACB calculation engine. Accepted file formats include Microsoft Excel (both .xls and .xlsx files) as well as CSV (.csv comma-separated value files). This feature is only available to AdjustedCostBase.ca Premium subscribers. The cost of the enhanced service is $49/year. The basic features of AdjustedCostBase.ca remain completely free for Canadian investors. This feature can be extremely useful if you have transactions in a spreadsheet file that you’ve exported from your brokerage account or if you prefer to compile a list of transactions using Excel or other spreadsheet software. By uploading the data using this feature, you can potentially save many hours of time and avoid data entry errors. Security The name of the security, which must match an existing security that you've already added to your account. Date The date for each transaction. When uploading an Excel spreadsheet (either .xls or .xlsx format) the date column should be formatted using any of Excel’s built-in date formats. When uploading a CSV file, the date column must be in “MM/DD/YYYY” format. Transaction Type The transaction type in each row must be set to one of the following supported values: "Buy", "Sell", "Return of Capital", "Capital Gains Dividend", "Reinvested Dividend" or "Reinvested Capital Gains Dividend". Amount The dollar amount of the transaction, assumed by default to be the total amount (as opposed to a per share amount). Shares The number of shares acquired or sold, applicable only to "Buy", "Sell" and "Reinvested Dividend" transactions. Commission The total commission amount for the transaction, applicable only for "Buy" and "Sell" transactions. Total or Per Share The value should be either "Total" or "Per Share" to specify whether a transaction amount is a total amount or per share amount (if this column isn't used the amount will be assumed to be the total amount). Memo Any free text that you wish to add as a memo for the transaction. Price in Foreign Currency? Indicates whether or not the value in the amount column is in a foreign currency, with the following acceptable values: "Yes"/"Y"/"No"/"N". Exchange Rate? The exchange rate applicable for the transaction, entered as the number of units of foreign currency equal to CAD$1.00. Alternatively, one of the following currency codes: "USD", "EUR", "JPY", "GBP", "AUD", "CHF" or "CNY". If a currency code is inputted, the exchange rate value reported by the Bank of Canada for the transaction's date will be used. Commission in Foreign Currency? Indicates whether or not the value in the commission column is in a foreign currency, with the following acceptable values: "Yes"/"Y"/"No"/"N". By default, transactions with the same dates for the same security will be imported in the order in which they appear in the spreadsheet (top to bottom), but you can reorder them at any time after the import. You should check off the option “Ignore Header Row” if the spreadsheet you’re uploading includes a header row. If this option is set, the first row of the spreadsheet will be ignored during the import process. A maximum of 200 transactions may be uploaded at a time. If you need to upload more transactions at once you’ll need to break your spreadsheet into multiple files. Also ensure that “Ignore Header Row” is checked because the spreadsheet includes a header row. Next, hit the browse button to find the spreadsheet file on your local hard drive. Finally, hit the “Import Transactions” button. The transactions will not be added immediately, and you’ll have a chance to review all the data before committing the transactions. Review this information carefully to ensure its accuracy. You may also see errors if there are invalid entries in the spreadsheet. The error messages should be detailed enough to help you identify and fix the errors, at which point you can try re-uploading the spreadsheet. Why must one first create the security in the portfolio before the importing transactions? It seems like an undue burden. Also, why is it limited to 100 transactions? Thank you for your suggestion. We have now added the option “Add Unknown Securities” that will add securities that do not yet exist. Please note that if the name of a security is even slightly different than one that exists already, it will be added as a new security with this feature is enabled. The limit of 100 transactions per spreadsheet is partly in place to discourage blind uploading of large amounts of data. While this feature is intended to save time by avoiding the need to manually enter data, the data should still be carefully to ensure correctness. As noted above, a large spreadsheet can be split into multiple smaller spreadsheets and uploaded one at a time. The Import function does not allow more than 2 decimal places. Do you allow importing Options trades? The import feature does indeed allow for a precision much greater than 2 decimal places. However, throughout AdjustedCostBase.ca monetary amounts are displayed rounded to the nearest $0.01 and share amounts are displayed rounded to the nearest 0.0001 for brevity. If you input a value with greater precision, either manually or using the import tool, the precise value you input will be used in the calculation. You can verify that the precise values have been imported properly by following the ‘Edit’ link next to an imported transaction. Options transactions are not supported by the import feature at this time. 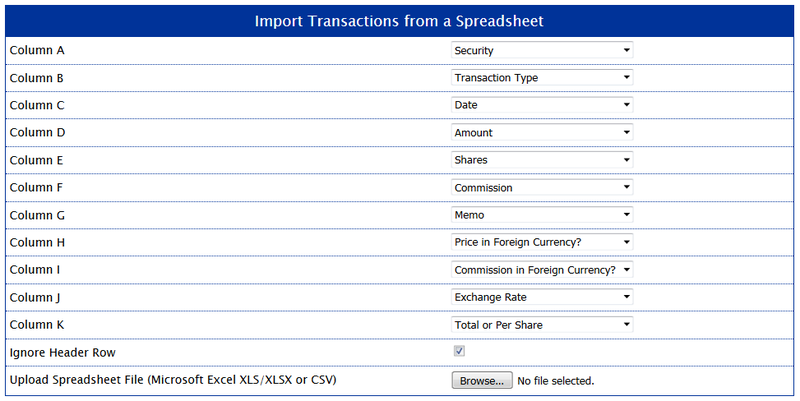 I’m trying to figure this tool out for my transactions as summarized in the XLSX from my Questrade account. I can’t quite figure out the Transaction Type, especially difference between “Reinvested Dividend” or “Reinvested Capital Gains Dividend”. I have a DRIP setup for my funds. Questrade’s XLSX has some of the transactions identified as REI (which Questrade calls “Dividend Reinvestment” — fine) and then they have Dividends, where some (mainly VAB.TO) don’t have DIV under the Action column, and others (mainly, but not consistently, VDU.TO) have DIV in the Action column. Any insight as to how I can label these properly? I’m unfamiliar with the specific format of the spreadsheet Questrade provides, but in the transaction reports I’ve seen from other brokerages, a dividend and its corresponding reinvestment are separated into 2 transactions (one for the dividend and another for the reinvestment). And if the DRIP is for whole shares only, then the amount of the reinvestment will likely be smaller than the dividend, with the residue being deposited as cash into your account. Dividends do not factor into calculating ACB unless there is a return of capital or phantom distribution (also known as a reinvested capital gains distribution) component. If the dividend/reinvestment is split into 2 transactions, then you should most likely omit the dividend transaction from the spreadsheet before uploading it (and include only the reinvestment). In your case, VAB.TO did record both return of capital and a phantom distribution for 2016 while VDU.TO had neither (although I did not check for previous years). In that case the reinvested dividends would be accounted for by the imported spreadsheet, and the return of capital/phantom distributions would be accounted for by the streamlined import feature. It is important to be careful with the ordering of the transactions in order to ensure that the reinvestment occurs after the corresponding return of capital/phantom distribution transactions. Hopefully this will help, but please feel free to elaborate on the format of your spreadsheet if I’ve misunderstood anything. Just uploaded my transactions and I am getting “appears to be a short transaction” message. I do not have any shorts and should not be seeing a negative share value. This is my first time with ACB.ca. Should I have created an initial fake entry at start of each new security entry to establish a starting point that would reflect my beginning share position ? That error indicates that a transaction has caused your share balance to fall below zero. You should check that all transactions prior to that one are complete and correct. I wouldn’t suggest putting a “fake” entry, as you should ensure that all prior transactions are inputted. If you’ve previously calculated your ACB using another method and don’t want to input all your prior transactions then you can edit each security’s initial share value and initial ACB. There must be a lot of people using TD Direct Investing/Webbroker, and the data we get is the “annual transaction summary” csv file from TD. Am I right about this? How do people import this in AdjustedCostBasis? Is everyone building their own Excel conversion solution by hand, or is there something out there already? I have about 400 transactions and I’m a bit discouraged by the work to convert the format. Also, am I going to have to set an exchange rate for each USD transaction? I’m not familiar with TD’s format. Which particular aspects are causing you issues with importing it into AdjustedCostBase.ca? If you have a sample you could either post it hear or send it via the contact form and I can try to offer some suggestions. We recently introduced a feature for AdjustedCostBase.ca Premium users allowing exchange rates to be easily retrieved when manually adding transactions. Would this be useful to you when importing a spreadsheet as well? I’ve hired a person to do my calculations last month, but I’m still planning to use AdjustedCostBase premium in the next couple of weeks to also do it on my own. When importing on your site is the Commision included in Amount? The TD format gives me is going to require a lot of data wrangling to get it in the requested format. So I was posting to see if anyone else had already a tool to do it. If I sold 500 shares, I might get multiple “fills” for it. this means 300 units for a total of 382$ and that includes the 7$ commission, followed by a 700 purchase with no commision. short sells with just be expressed as a sale followed by a purchase. 2) fetch and the exchange rates automatically from the bank of canada, for the date of transaction. This is because you want to compare which is the optimal conversion rate to minimize your taxes. Some people might want to use a custom rate based on when they converted their CAD to USD, but I think that’s not allowed by CRA. Anyway, it’s difficult to keep track of with multiple conversions and over time. In any case, I never want to enter an exchange rate for each US transaction. Just wanted to thank you for allowing investors to use this tool. It is an invaluable resource for us do-it-yourselfers. I have been DRIPing for ten years in non-registered accounts without doing regular ACB tracking, and last year decided to shelter some of these investments in a TFSA. The result is that I have a bunch of capital gains to declare, and over 800 entries for ACB calculations. Normally the amount should not include the commission and the commission should be specified separately. However, you can choose to exclude the commission but add it to the amount in the case of a purchase or subtract it from the amount in the case of a sale. For example, if you buy shares for $1,000 (excluding commission) with a $10 commission you could input either a) a total amount of $1,000 with a commission of $10 or b) a total amount of $1,010 with a commission of $0. The result should be the same either way. 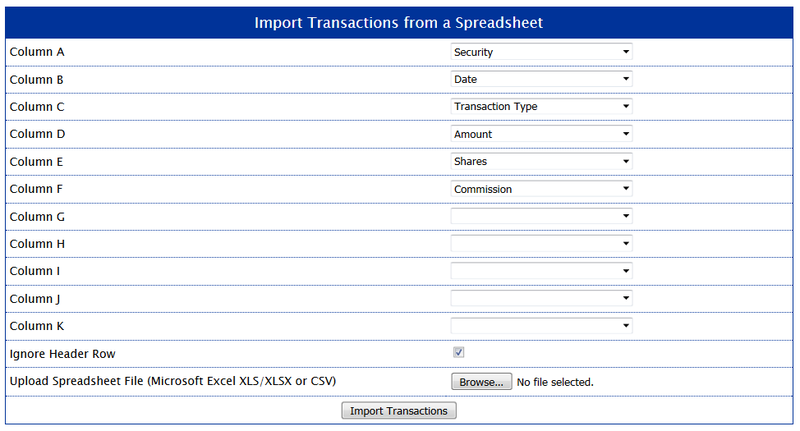 This is the case whether you input transactions manually or import them from a spreadsheet. as long as these 3 transactions aren’t interspersed with other transactions. The same is true if a buy transactions is split into multiple parts with the components adding up to the total values. However, it may cause some confusion seeing these transactions separated on AdjustedCostBase.ca. For short sales, gains or losses are typically considered to be on income account, not capital account. Therefore ACB and capital gains are not calculated for short selling. I would suggest you be consistent with using either the average annual exchange rate or the daily rates from year to year, rather than toggling between the two choices based on which provides you with more of an advantage. Thanks for your great replies. I’ve purchased Premium and I’m importing my transactions. I think im in the same boat as frederic, also using TD Webbroker, and the format is quite different. I’ll post an example, so hopefully we can figure out the best way together. Btw, I noticed Frederick said he wants the option to choose between average and actual exchange on transaction date, but (and im guessing here) I imagine the CRA will want us to do one or the other, not pick and choose per transaction? I’m going to go with the logic that we should be able to choose per ACCOUNT, or maybe per SECURITY, based on what is most FAIR, rather than makes the most profit, as im sure CRA cant argue against that. Otherwise, I think if doing it based on most profit, it should be one option or the other, to be seen as fair in CRA’s eyes, rather than per transaction. I can send the full CSV if that helps, but rather not post it here for privacy reasons. On their web site the CRA has stated that they allow an average annual rate to be used, however, they have also contradicted themselves on this matter. As a result I would recommend using the exchange rate on the date of the transaction. Furthermore, with transactions involving an actual currency exchange, this will be more beneficial as any currency spread or exchange costs will be factored into your ACB, resulting in lower capital gains. In either case I would recommend being consistent – choose one method and sticking with it for all securities and all years.